Ria Gusain did her schooling from K V, IMA. After that she did M Sc in Stats from D A V, PG College, Dehradun. 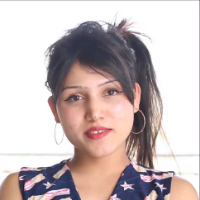 She did 6 months course in dancing from Beat Breaker Dance Institute, Dehradun. She started dancing in 2014 and currently working as a dancer & choreographer at SDC Dance Academy. Dance is a performance art form consisting of purposefully selected sequences of human movement. Dancing is way to express yourself in a best way and dancing is what that makes you happy in every situation. "After completing my MSc in Stats, I did 6 months dancing course from Beat Breaker Dance Institute, Dehradun. Currently I am working as a dancer & choreographer at SDC Dance Academy."